Harvest Time: Usually not recommended to allow the fruit to develop the first year, but I say, eat any you can get. Culture: Needs well-drained, highly organic soils. Raised beds are best. Strawberries can be grown in containers. Matted row or perennial beds should be planted in the winter (December-February). Strawberries are harvested about 16 months later in April or May. Annuals are planted in the fall (early November) and harvested the next spring (February-April). When planting strawberries in-ground, be sure the crown is above soil level and the upper most roots are 1/4 inch beneath soil level, buried crowns rot and exposed roots dry out. Strawberry plants should be placed approximately 14 to 18 inches apart from each other in neat rows that are separated by 2-3 feet each. Let runners fill in until plants are 7-10 inches apart. Troubles & Solutions: Slugs and snails are the most common pests. Use cedar flakes, hot pepper, and D-E (diatomaceous earth) around the plants. Spider mites are controlled by watering properly - not too much or too little. Flare-up infestations can be controlled with garlic-pepper-seaweed tea. Various soil-borne diseases are controlled with cornmeal at 20 pounds per 1,000 square feet. Leaf and fruit fungal diseases are controlled with Garrett Juice plus garlic and potassium bicarbonate. Harvest and Storage: Harvest whenever the fruit is red all over and ripe. 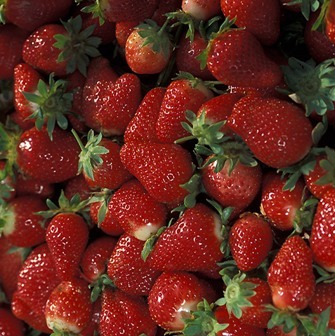 Store in the refrigerator, after ripe at 32-40° but strawberries don’t last long, so eat them quick. Might last 1-5 days.